What a fun back-to-school September it’s been! One recent highlight: I was welcoming more than 100 Harrington School faculty back to campus at our first faculty meeting on September 7. I had just offered my warmest thanks to our amazing leadership team, including Nedra Reynolds (Writing and Rhetoric), Lynne Derbyshire (Communication Studies), John Pantalone (Journalism), Rebecca Romanow (Film/Media) and Regina Bell (Public Relations). These talented individuals worked throughout the summer with me to build the future of our new School. We were about to showcase our progress. 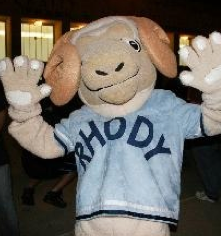 But our meeting was suddenly interrupted by the entrance of the school’s plushy mascot, the Rhody Ram, who was dancing like a crazy animal and carrying a boombox. This strange character caused a stir among the faculty and this inspired the Harrington Rangers, seated unobtrusively in the audience, to leap to the front of the room to introduce themselves (in sound-off Annette Funicello-style, for those of you who remember the Mouseketeers). They explained that the Rangers are our brand-new student leadership team, our most outstanding and impressive students who serve as brand ambassadors and peer advisors. Just then, there was an additional surprise when then students (and the Ram) presented me with a birthday cake. It was indeed a charmingly disruptive flash mob. What a terrific back-to-school is beginning in this New Year!